This boat features a walk around deck and spiral staircase to the fully railed upper deck. It is comfortably equipped with a stove, oven, 2 full- height propane refrigerators, hot & cold running water, shower, & propane barbecue. It comfortably sleeps 14 persons, including the dinette. It has a bath and a half. A generator, TV/VCR, microwave oven, and AM/FM cassette stereo are on board. Requirements: HOUSEBOAT BOARDING INFORMATION Weekend: between 2 pm and 5 pm Friday (as boat is available) to 9 a.m. Monday Holiday Weekend: between 2 pm and 5 pm Friday (as boat is available) to 9 a.m. Tuesday Mid Week: between 2 pm and 5 pm Monday (as boat is available) to 9 a.m. Friday Weekly: Thursday (JVR & Lakeview), Friday, Saturday, Sunday or Monday boarding time is between 2 pm and 5pm (as boat is available) to 9 a.m. of the same day of the following week. 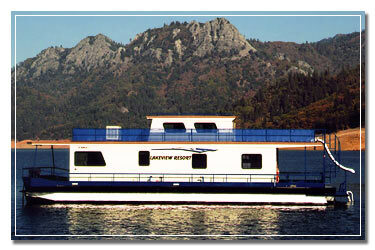 HOUSEBOAT RESERVATION TERMS A security deposit of $500 is required within one week of making a houseboat reservation. The deposit is refundable by check when you return the boat clean, undamaged, full of gasoline and with all inventory intact. Full rental payment is required at least seventy-five days before departure. Cancellations made at least seventy-five days before departure will result in a cancellation fee of $200. Cancellations forty-six to seventy-four days before departure will result in forfeiture of $500 security deposit. Cancellations within forty-five days of departure are subject to forfeiture of the full rental amount. Changes in reservations within seventy- five days of departure are subject to cancellation terms. All rates are subject to change without notice. Charter Captain must be at least twenty-five years old.